This delicious roasted asparagus recipe is easy and makes a beautiful side dish. Drizzled with soy sauce and sesame oil, roasted and finished by sprinkling some grated lemon peel over the top. Great for entertaining and everyday meals. 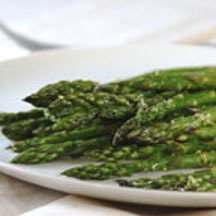 Place asparagus on a rimmed baking sheet. Drizzle with oil, soy sauce and sesame oil. Sprinkle with half of lemon peel. Bake for 10 minutes or until asparagus just begin to brown and are easily pierced with a fork. Transfer to platter and sprinkle with remaining lemon peel.